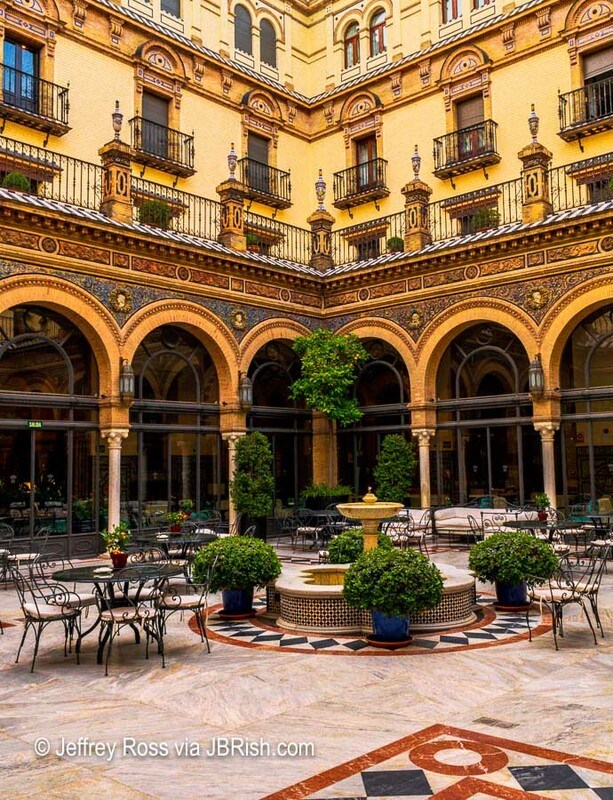 We continued to be enchanted with elegance and beauty of the Alfonso XIII hotel. 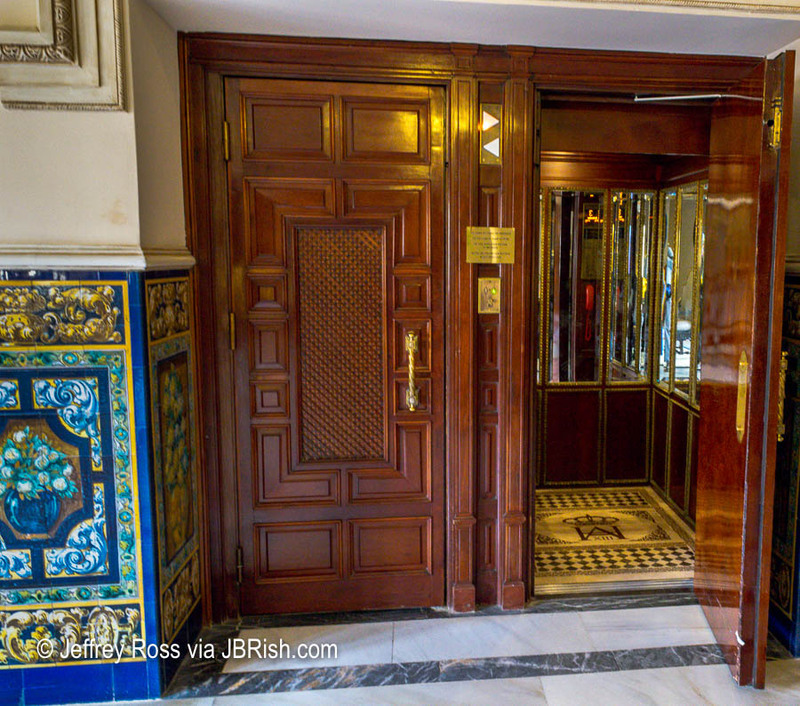 The heavy wood tones, mirrors and gilding of this somewhat intimate elevator made the ride up and down the few flights a royal experience. In the first post, I presented a picture of the courtyard from the inside corridor of the hotel. Below is a photo of the exterior aspect of the distinguished courtyard. 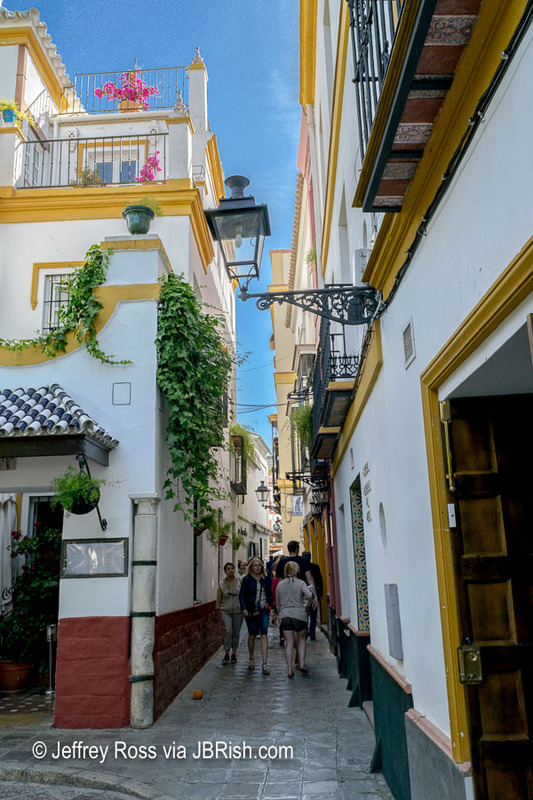 One of our favorite “touristy-type” things to do when visiting cities that are new to us, is to walk up and down the streets to enjoy the architecture and local ambiance. 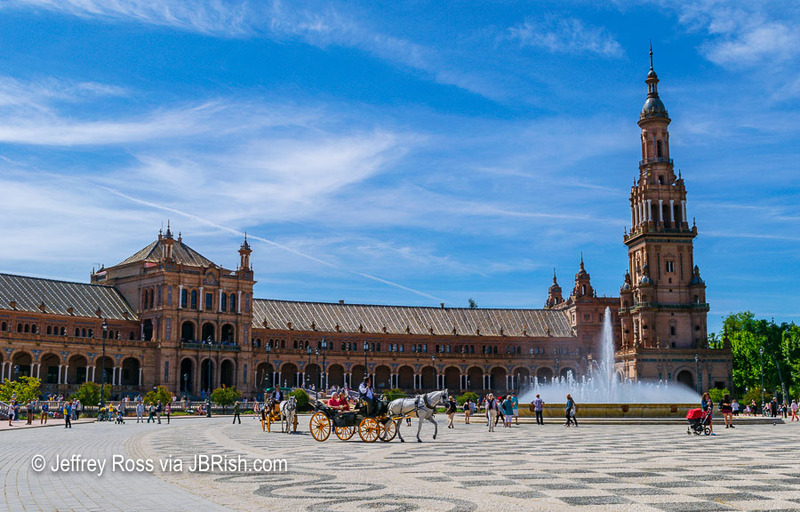 Seville had plenty to offer. 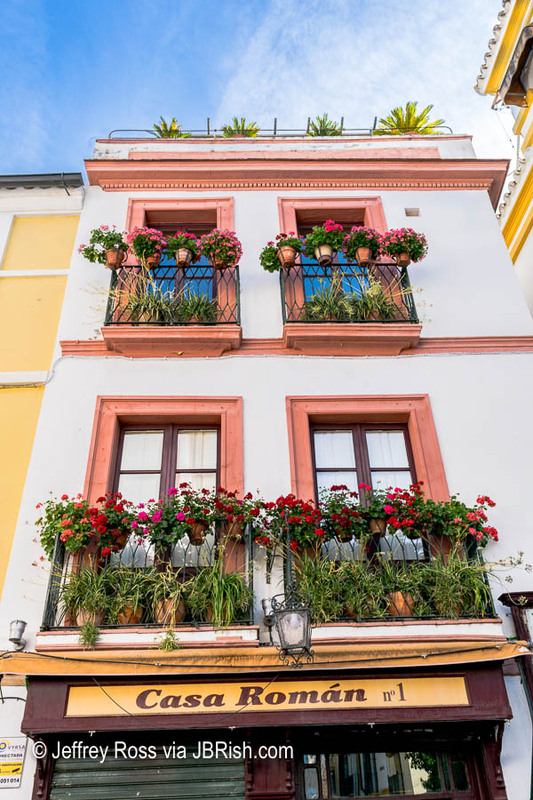 We appreciate the beautiful colors of the buildings as well as the accompanying wrought iron and floral touches. Often as we walked the avenues and pathways, we would stumble upon historic sites or markers. 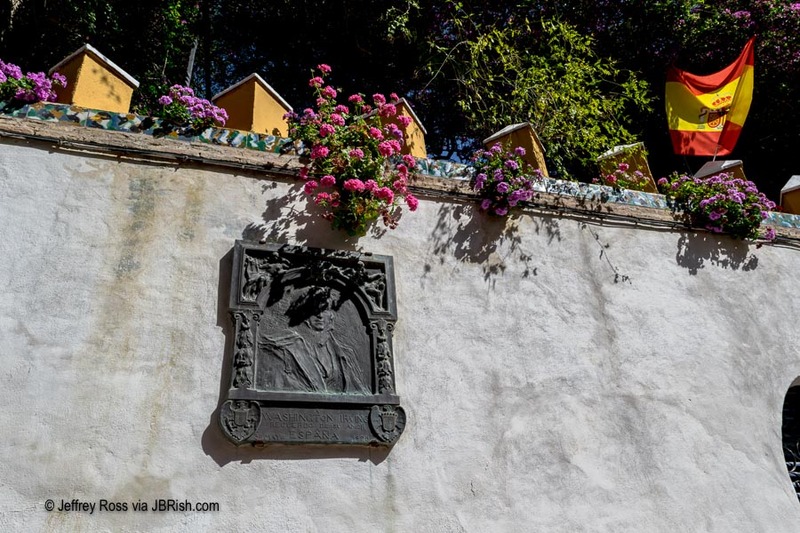 At the Plaza de Dona Elvira, we came across a museum dedicated to the painter Amalio Garcia Del Moral. He was born in Granada and began his artistic studies there. He was quite accomplished and was awarded a number of scholarships. 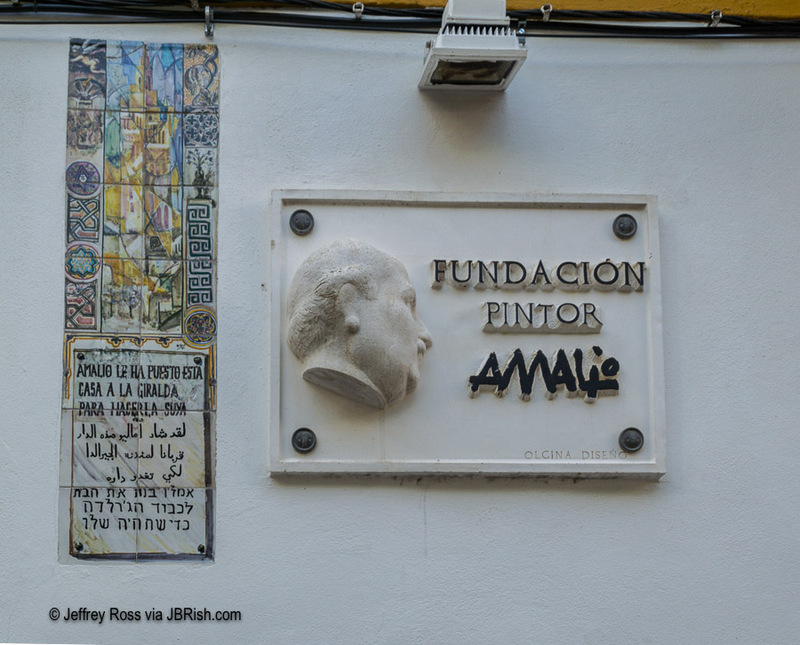 He died in Seville in 1995, but shortly before his death he established a foundation to promote his artistic legacy and inspire continued exploration of the arts. In any country, observers will find cultural artifacts of both past and present characteristics of the area. 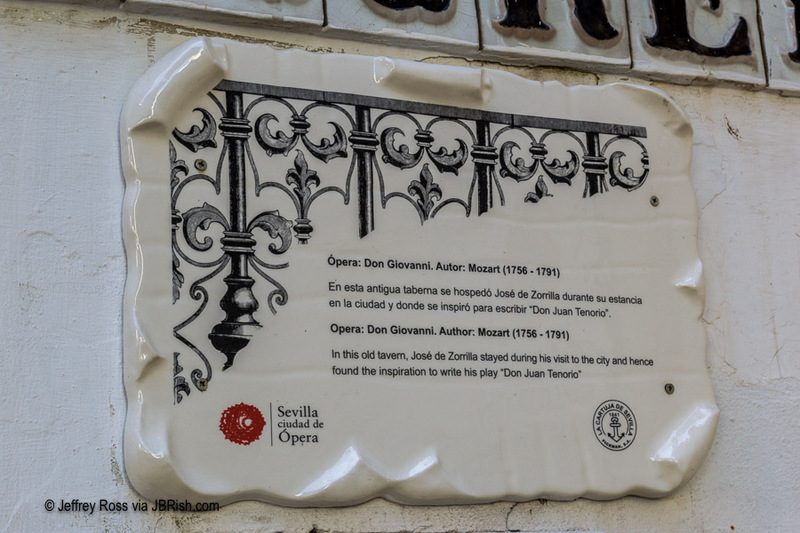 The marker below denotes the place where José de Zorilla found the inspiration to write the Opera Don Juan Tenorio during his stay in Seville. 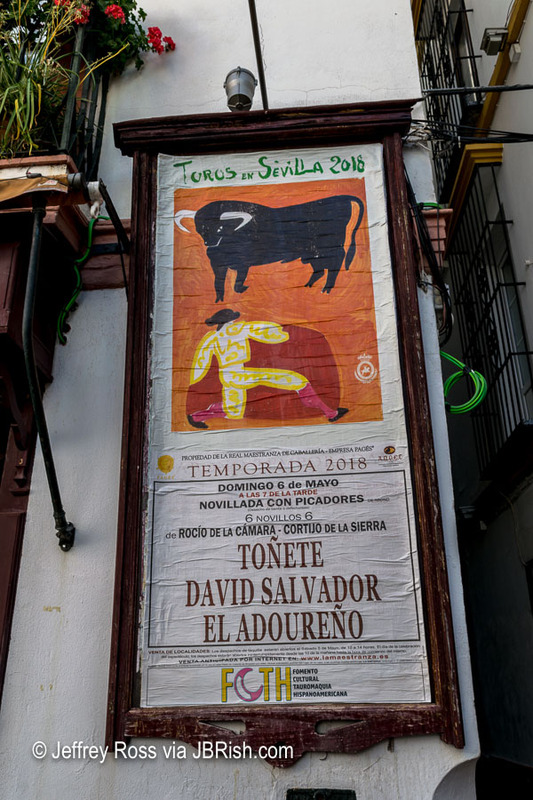 It was surprising to see a placard with the likeness of Washington Irving as we strolled along even though I was aware he wrote Tales of the Alhambra – (1832). 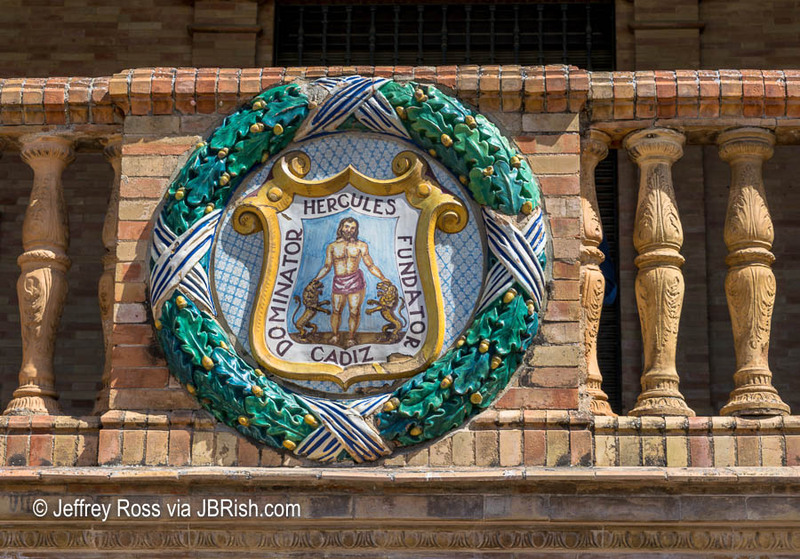 Evidently, Irving visited Seville in 1828 as an accomplished author and became a diplomat. He stayed in the old Jewish quarter for a time near the area where this memorial is located. Irving was also interested in the history of Christopher Columbus and thus Seville was a good match for him. Who knew? 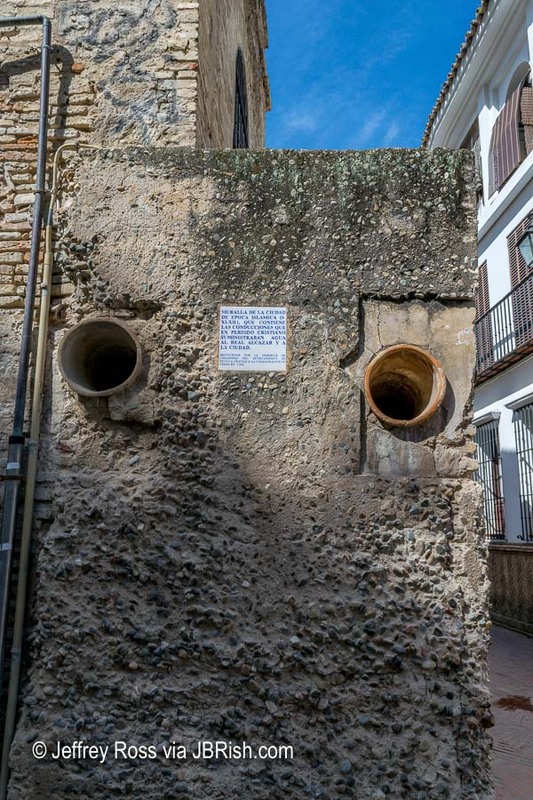 The picture below is of an old water system dating back to the 11th or 12th century which contains pipes from the “Christian period.” These pipes supplied water to the city and the Alcazar. 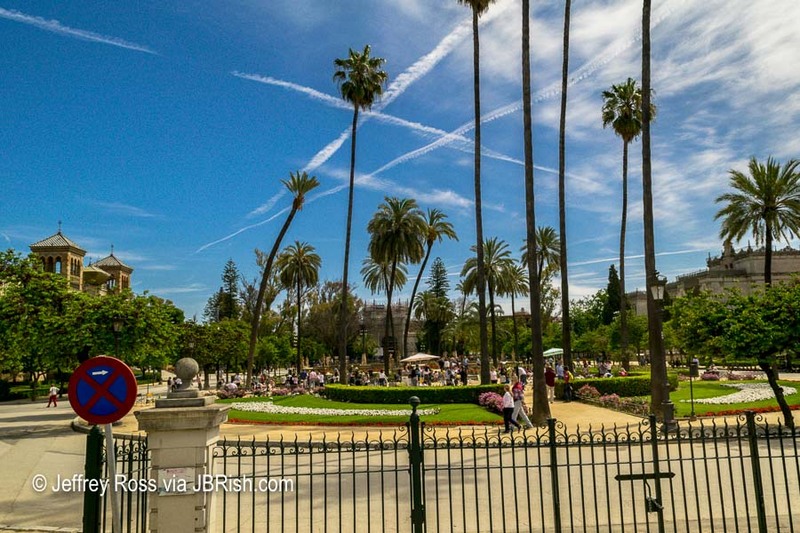 Once again we found ourselves in the Murillo Gardens which is a lovely place to spend time enjoying the plants, water features and to people watch. 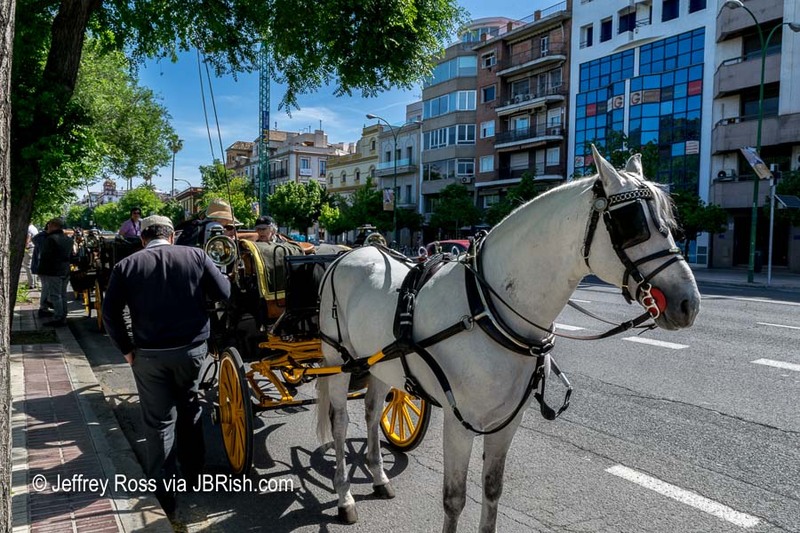 It is also near the street where horse drawn carriages can be hailed to take an open-air ride around town. Indeed we boarded such a carriage to travel to a special location in Seville. 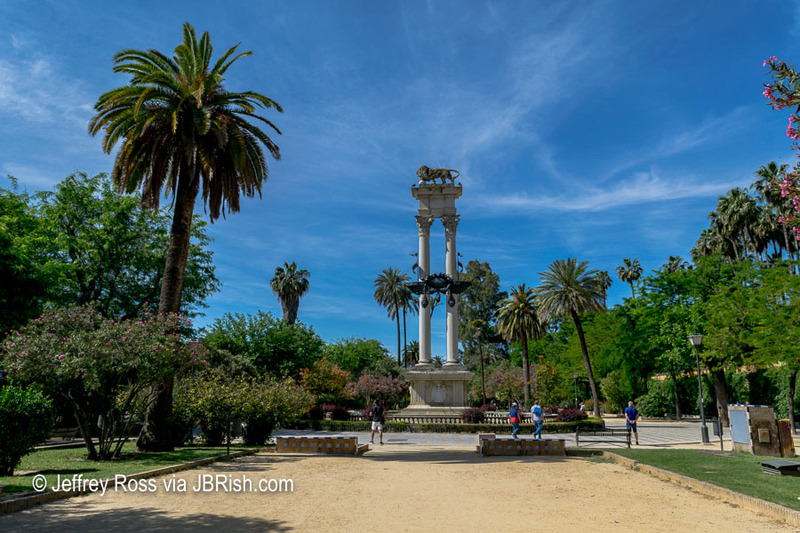 The Parque Maria Luisa which is the site of the 1929 Ibero-American Exposition. 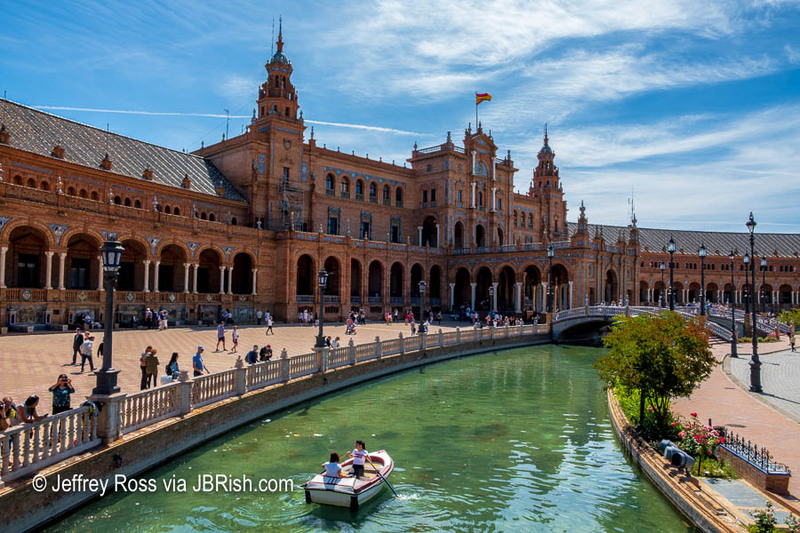 The main attraction is the Plaza de España, a semi-circular brick building with ornate and colorful touches. 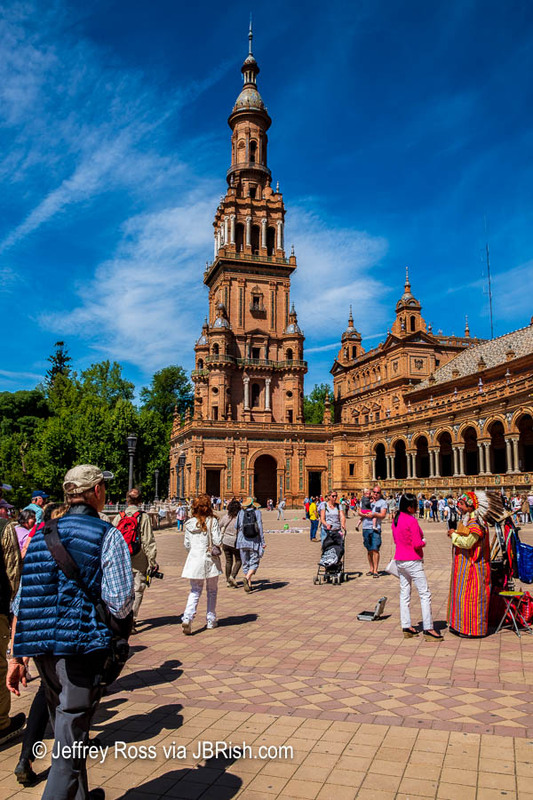 The towers that anchor each end of the building, much like the Giralda, can be seen from many parts of town. 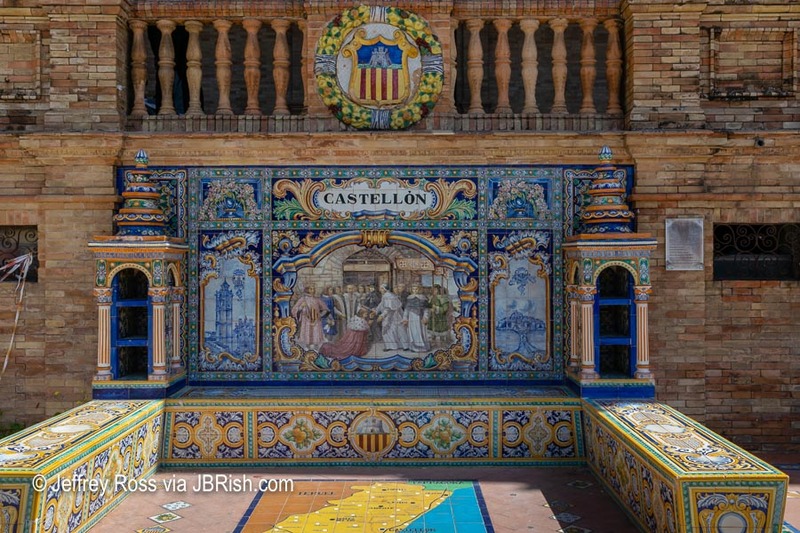 Along the base of the building, there are 48 alcoves with colorful tile murals, benches and maps representing Spain’s provinces. The fountain in the middle of the large, granite tiled plaza adds another focal point to the square. Note – At times the area can get crowded. 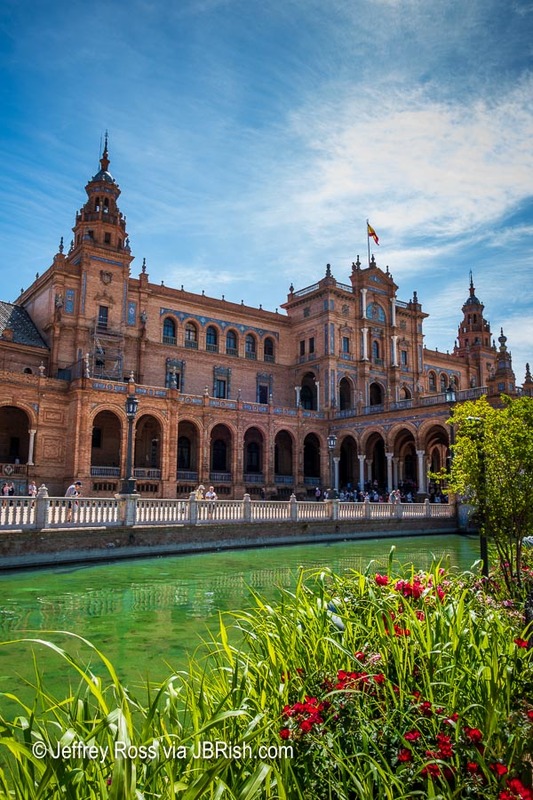 While it appears that we have seen so much in Seville, there was quite a bit more to enjoy before it was time to say adiós!